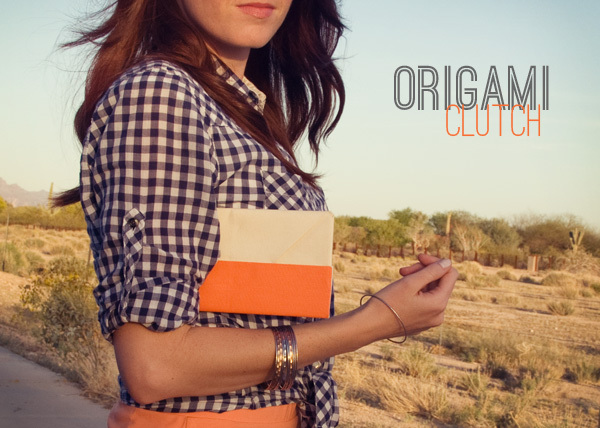 After writing about origami inspired clothing I had origami on the brain and came up with this origami clutch. It's super simple and requires NO sewing! Fabric- Preferably heavier cotton. Mine is decorator weight. Fabric stiffener- I found mine at JoAnn's for less than $5. Small spreader- A credit card works! 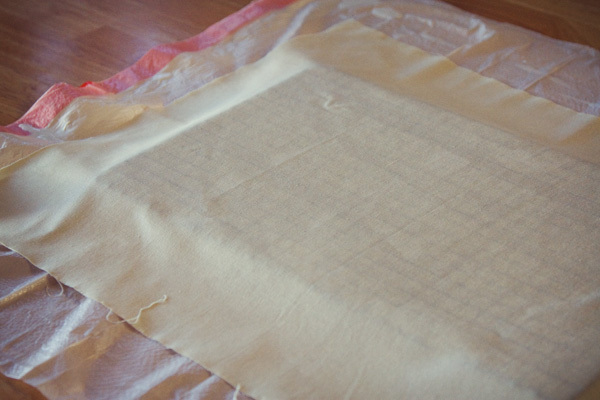 Cut your fabric into a rectangle measuring 17 3/4" x 23". 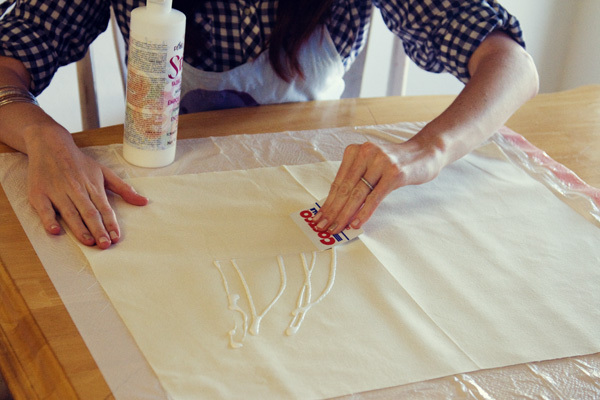 Lay out some plastic on your work surface and place your fabric on top. Yes, Stiffy. Oh, the jokes that have come from this bottle. 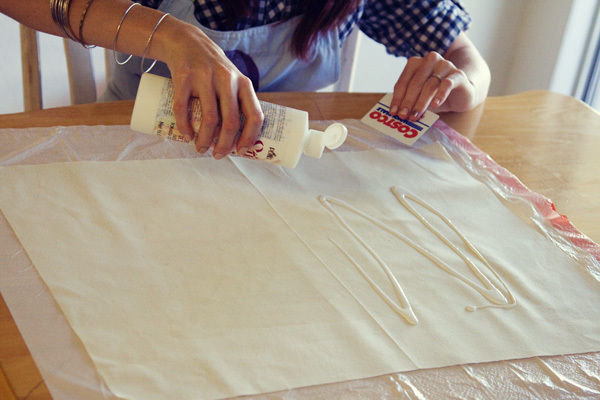 Squirt your fabric stiffener on to your fabric and use your spreader to pull the stiffener around and coat the entire surface. Make sure you get the edges and corners. When you've thoroughly covered one side, flip your fabric over and repeat on the other side. It should be saturated but not sopping wet. Set it somewhere to dry. I've done this twice now and used a cooling rack both times. The first time it worked great and the second time it left weird impressions and stains on the fabric, so be careful with that. A piece of window screen or a sweater drying screen is probably your best bet. Don't worry if it dries into a funky shape. We'll fix that in a bit. 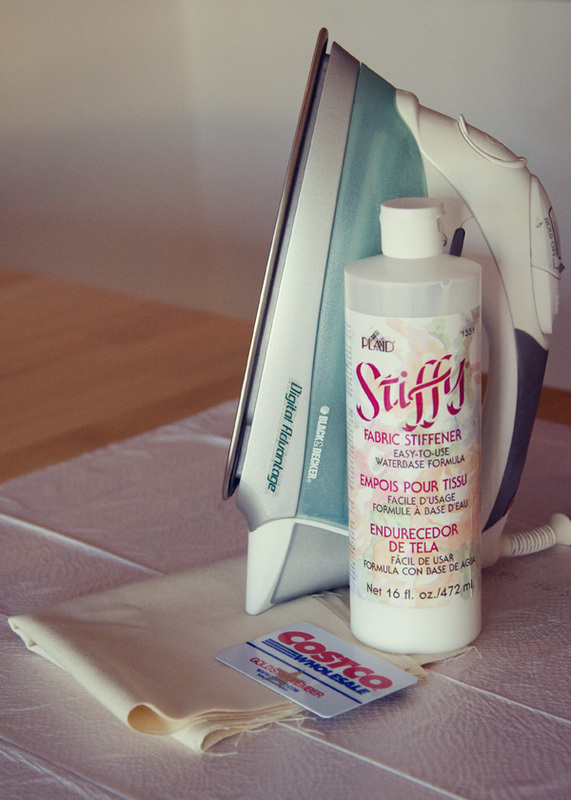 When it's completely dry (give it a few hours or overnight), iron your fabric flat. The heat should make it go limp. Let it cool on a flat surface. It should become stiff again as it cools. When it's flat and cooled, take your scissors and trim a quarter inch off each side. It should be just enough to get all the loose threads and wavy edges off. I made the rookie mistake of not cleaning my iron before I got started and ended up with some junk on my finished clutch. I busted out my orange fabric paint and easily covered up the spots. This is a really slim clutch..you won't be able to fit lipstick and your car keys in there. 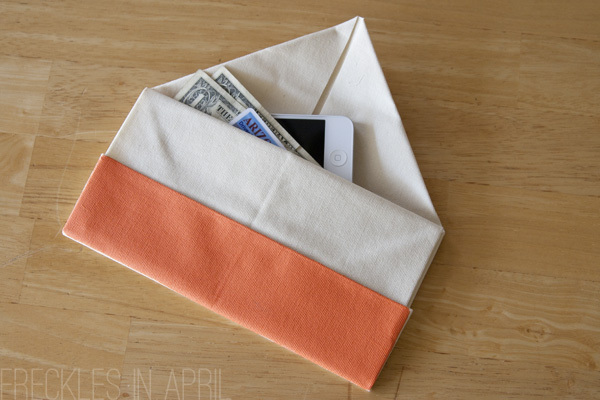 It's perfect for some cash, an ID, and maybe your phone if it's thin. I have grand dreams of a whole line of clutches to match whatever I'm wearing for date night. How awesome would that be? This is awesome! I would love to do this but I definitely don't have your awesome DIY skills.... Ahh well maybe I'll still try! 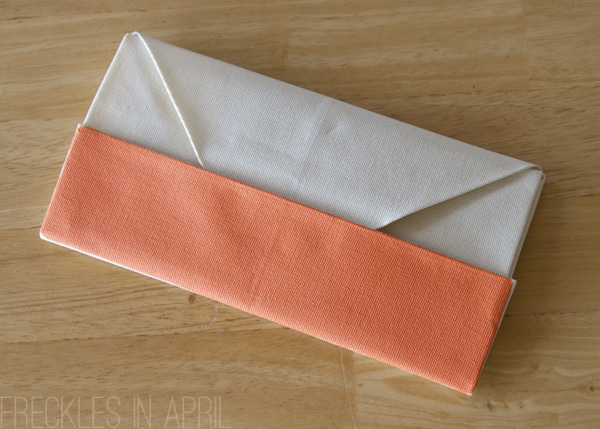 Did you see that Little Tin Soldier is co-hosting a DIY clutch party? You should definitely link up with her and share this. Question? If you wanted to make a larger one could you scale the pattern up or do you think that would that end up too unstable without reinforcing the fabric? I'm sure you could scale it up. The size I chose was based on a clutch I already own where the length was 10 inches. I figured that was a good size for a clutch and aimed for a finished length of 10 inches. I started with an 8.5x11 piece of paper (which makes an envelope that is 2.25"x4.25") and scaled up from there. This post is one that, had we not already known each other in real life, would have catapulted you into the, "I'm sure she's fantastic, but she's in a whole other class of woman that I will never, ever reach." 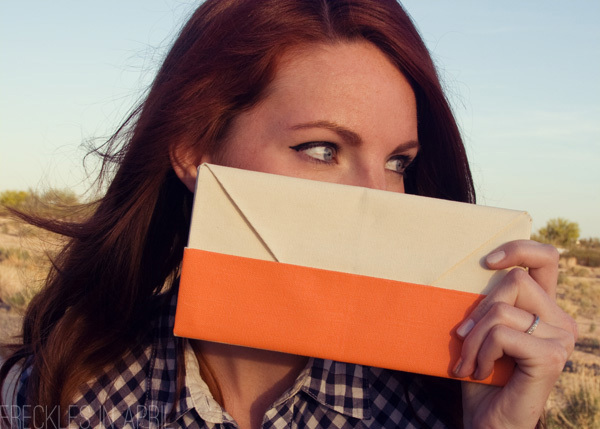 You look stunning in all your pictures, and you're crafty! I am thoroughly impressed. This is so cool! I use to fold up notes in school like this, so I think I can pull it off. lol I'm definitely going to try! Thanks for sharing! Very cool idea! And I think the orange made it even better. Fun! I love how it requires no sewing (since my sewing skills are lacking). P.S. I love the origami collage you made for your post yesterday. The clutch is a great idea, but I need to tell you I just love that skirt together with the blouse. Perfect combination though I would never have considered mixing these two. Thank you! That was one outfit where I went to my husband and asked, "Does this go together?" And he was like, "um..oh hey, look over there! Something shiny!" So cool! Love the clutch. Ooooh, a fabulous use for the leftover fabric stiffener I have from a different project... need to go dig through my fabric stash now. Love your outfit too - knotted gingham + skirt is so cute, and the colors are great. That the cutest clutch! You look awesome, cute outfit. Saw this over on Holly Dolly and wanted to tell you how chic it is! I may give this a try with some leftover fabric this weekend. Thanks for the tutorial! I love this origami Knuckle Clutch . You are looking super cool in this outfit . How clever! I'm going to have to get friendly with fabric stiffener soon! Do you think you could use canvas or upholstery fabric and skip the whole stiffener?